On the same weekend of the Super Bowl, the UFC continues tradition, with an event from Houston, Texas. 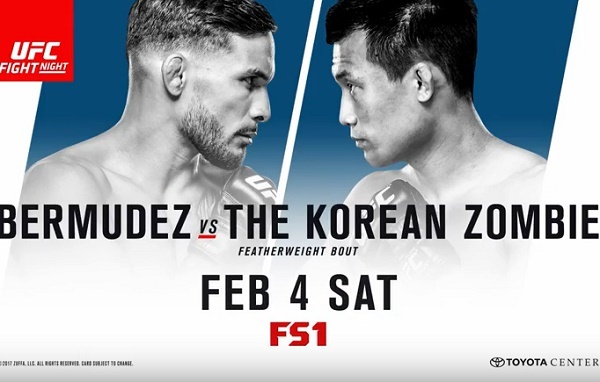 Headlining the card is the return of the “Korean Zombie” Chan Sung Jung against top Featherweight Dennis Bermudez. Jung, has been on the shelf since August of 2013, as he was serving his mandatory two year military service in South Korea. In his last outing, he fell defeat to Jose Aldo for the Featherweight Title due to a shoulder injury. Bermudez, has stringed off two straight victories, which has put him back into contender status within the division. Bermudez once won seven straight, but two straight defeats sent him spiraling down the division. Co-Headlining the card, a pair of Strawweights do battle, as the Mexican phenom Alexa Grasso puts her undefeated record on the line against veteran Felice Herrig. Grasso, most recently defeated Heather Jo Clark in her UFC debut. It was a dominant performance, as she showcased her superior striking. Herrig, is coming off an impressive first round submission victory over Kailin Curran. 145 lbs. : Denis Bermudez vs. Chan Sung Jung – Can’t Wait! Love both these guys, as they just deliver every fight. Jung AKA The Korean Zombie might just be the most exciting fighter to ever step in the octagon. His granite chin and wild yet creative fighting style has aided some of the most insane mma fights to date. The mandatory two year military service he had to serve was a shame, as he was in his prime at the time and we lost opportunities at seeing the Korean Zombie. As for Bermudez, this is a great opportunity to get right back into the Featherweight title talk. He’s rattled off two straight victories and is 9-2 in his last 11 fights. A big fight is definitely in the horizon. As for a prediction, I’m siding with Jung. Even with all this time off, I still believe that Jung will be the same guy he was 3 years ago. Who knows too, the 3 years off could of done good to the body and mind, as the amount of punishment endured as an active fighter is insane. Anyways, while Bermudez might be a powerful wrestler, heavy handed and have a granite chin…I’m just not sure he can keep the pace for five rounds. Jung can hang in there until the end and I think towards the later rounds, he’s going to turn the tide of the fight. So with that, I have Jung via decision. 115 lbs. : Alexa Grasso vs. Felice Herrig – Man, it seems like Herrig has been in this position before. The gatekeeper position is what I’m referring too. She’s had to fight all these young guns and Grasso is definitely going to be the best one she’s faced. I mean, Grasso is one of the best strikers at 115 lbs., as her volume and precision are unreal. As for a prediction, it’s obvious…Grasso via dominant decision. 155 lbs. : Abel Trujillo vs. James Vick – This one won’t last long. Trujillo is a killed or be killed type fighter and Vick doesn’t shy away from a brawl himself. And while I’d love to pick Trujillo because of his insane power advantage, I just can’t trust his cardio. He’s a one round fighter and that doesn’t bode well if you can’t get the job done early. So, I’m banking on Vick evading Trujillo’s power shots or weathering the storm and winning this via submission. 205 lbs. : Volkan Oezdemir vs. Ovince Saint Preux – You down with OSP? I am and he’s got a newcomer here to end his two fight skid. I can’t see him losing this one, as he’s one of the most athletic and explosive light heavyweight on the planet. Throw that in with this Oezdemir taking this on short notice and making his UFC debut…and expect a OSP KO! 265 lbs. : Marcel Fortuna vs. Anthony Hamilton – No idea who Fortuna is, but I know of Anthony Hamilton. Guy is so inconsistent. Either looks like a killer or absolutely terrible. Unfortunately I have to side with him here though…so I guess Hamilton via KO! 115 lbs. : Jessica Andrade vs. Angela Hill – Poor Angela Hill. She had to fight Emily Kagan (Win), Tecia Torres (Loss) and Rose Namajunas (Loss) in her first three UFC fights. Keep in mind, she was only 1-0 as a professional at the time and had a few exhibition fights on TUF 20. So, after two straight losses, she gets cut and revives her career in Invicta, becoming a champion. Then she gets paired up with a killer in Jessica Andrade… So with that, I got Andrade via decision. 265 lbs. : Curtis Blaydes vs. Adam Milstead – Blaydes is a monster wrestler, meanwhile Milstead is a reckless striker. Advantage Blaydes and this one shouldn’t even be competitive nor pretty…Blaydes via KO! 145 lbs. : Chris Gruetzemacher vs. Chas Skelly – After absolutely starching Maximo Blanco, Skelly gets a relatively favorable matchup here. His grappling should wear away Gruetemacher, eventually submitting him. And if he does get the W, that would make 6 of his last 7, lining him up for a big fight! 135 lbs. : Ricardo Ramos vs. Michinori Tanaka – Ramos I have no idea about and I’ve seen Tanaka once or twice before. He’s tough and pretty well rounded, but more so grappling oriented. So with that, I’m siding with Tanaka. 115 lbs. : Bec Rawlings vs. Tecia Torres – The “Tiny Tornado” all day here. Rawlings just doesn’t seem UFC caliber, which could be due to a tough weight cut. Anyways, Torres via decision. 170 lbs. : Alex Morono vs. Niko Price – So, I know Price upset a spiraling downhill Thatch, which is still impressive despite me adding “spiraling downhill” to downplay the win. BUT, Morono should be getting more love here. The guy debuted on short notice against a tough veteran in Kyle Noke and won. Then he fights a crafty striker in James Moontasri and knocks him out. I don’t see any reason why he doesn’t win this one either by KO! 205 lbs. : Daniel Jolly vs. Khalil Rountree – Never seen Jolly fight, but I’ve seen Rountree a handful of times. He’s a knockout artist and I expect nothing less here…Rountree via KO!